You have just tossed a coin that has come up heads for the tenth time in a row. What is the probability that it will come up heads the next time, assuming the coin has not been tampered with? You are an employment manager in a land where there are only absolute liars and absolute truth tellers. An applicant comes in to see you and appears to be sincere. He tells you that the next interviewee has told him she is a liar. Is he (a) lying or (b) telling the truth? Which of the following scrambled words is the "odd man out" when the words are unscrambled? Five men competed in a car race. Will did not come in first. John was neither first nor last. Joe came in one place after Will. Walt was two places behind James. If 40 pizza bakers can bake 20 pizzas in 2 hours, how many hours will it take 2 pizza bakers to make 10 pizzas? (A) All songbirds stick together. (B) Feathered birds get along well. (C) People tend to congregate with others like themselves. (D) If you see a lot of birds together, they will probably be the same color. Feathered birds get along well. People tend to congregate with others like themselves. If you see a lot of birds together, they will probably be the same color. If Sally's daughter is my son's mother, what relationship am I to Sally if I am male? A snail is climbing out of a well. The well is 20 feet deep. Every day the snail climbs up 3 feet and every night he slips back two feet. How many days will it take the snail to get out of the well? Whoa! 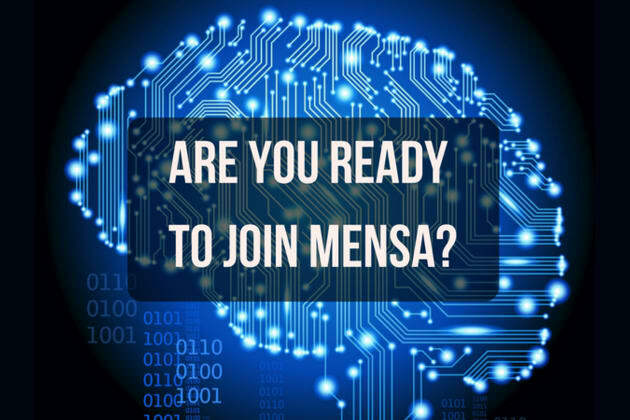 You can join Mensa with that gigantic brain of yours! You've outsmarted even the smartest of Mensa members by taking this test! How is it that one person can be so unbelievably brilliant!? Be sure to keep taking tests like these, because if you don't exercise your gigantic genius brain, it'll shrink down into a piddly little thing. And who wants that, really? Don't apply for Mensa membership yet. Just saying. Well, contrary to popular belief, this isn't the end of the world. In fact - think of it as a beginning! Because the only place you can go from here is up. Up and onward and into the brilliant community of Mensa minds. Keep training, and victory will one day be yours! Should you join the world's smartest society?